​It is with respect and admiration for your profession that I offer a few pointers concerning your communication with your Spanish-speaking clients. After all, I am the one who communicates your words into Spanish. I have been present in hundreds of legal proceedings, ranging from attorney/client meetings to trials, and I want to share my personal observations with you, as I cannot do it while we work together. GREETING: When meeting your client for the first time, do not get down to business right away. Do not introduce yourself with a solid business-like handshake; use instead a gentle grip that should come across as warm and caring. This applies to all social levels. BUILDING RAPPORT: Ask about your client’s wellbeing. Spend a few minutes talking about what may seem like banalities to you, but that might mean the world to your client. Showing a personal interest goes a long way in building trust, and this also applies to all social levels (Gregoire et al: 2007). In general, Latinos avoid eye contact with authority figures as a sign of respect. This is a cultural difference; it does not mean your client is admitting guilt, hiding something, or being evasive. However, once you have built a rapport it should no longer be a problem. A Spanish-speaking businessperson or professional should not have an issue in this area since you are his or her equal. KINSHIP: Family is not limited to the nuclear family, but might include any blood relative such as nephews and nieces, who may happen to be second cousins! Be specific when inquiring about family members, since an uncle may actually be a first cousin, once removed. Two untranslatable terms may cause problems when you’re vaguely familiar with one possible meaning but not familiar with kinships: compadre (m) and comadre (f), mistakenly believed to be simply a “buddy,” but that’s not always the case. These terms actually refer to the relationship that exists between the parents of a child and that child’s godparents; considered a fictive kinship, as they are in essence “co-parents.” The child of a first cousin is considered a niece or a nephew. If a client mentions a husband or a wife, always ask if he or she is legally married. Most will refer to their significant other as “my wife” or “my husband” out of respect. They are not lying to you; to them it is just semantics, not a legal definition. ASKING QUESTIONS: When asking Spanish speakers a question, do not use double negatives unless you want a wrong answer. There is a reason even the courts frown upon double negatives. Try not to have false stops when asking your question; interpreters will have to reformulate your question so it makes sense in Spanish. When reading from a transcript followed by a question, please provide the interpreter with a copy of the transcript. REFORMULATE YOUR QUESTIONS: If your Spanish-speaking client or deponent is not answering a question correctly, he or she may not have understood the question and is embarrassed to admit it. Ask the question in a different way, using easier terms. 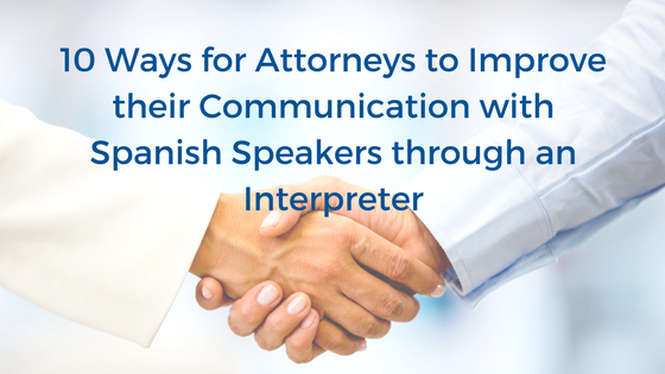 Be mindful of a person’s education level and their unfamiliarity with the legal process in the U.S. You may inquire of the interpreter, off the record, if there’s an issue with a certain term. The interpreter may suggest alternatives. PROFANITY: Refrain from yelling and using profanity. In criminal matters it is common with younger attorneys to attempt to build a rapport with English-speaking clients by using ‘street talk,’ slang, even profanity to get the message across. Never use this type of talk with your foreign-born Spanish-speaking clients; they may question your professionalism and may not trust you. Do not yell at your client, he won’t understand you; you are in fact yelling at the interpreter who can hear you at lower decibels. There may be times when a client may even attempt to substitute you in court and you will not understand why, since you have done everything possible to ‘communicate effectively’ with your client. Again, Hispanics show a great deal of respect for those who are in a higher position and are hired or appointed to help them, but they demand respect as well. PRIVACY: In general Spanish speakers may not voice a disagreement with you; they may not understand a question yet they may answer it to avoid showing a negative feeling. This is part of their cultural values of dignity and respect. It’s also hard to talk about family as Latinos value privacy and do not air their ‘dirty laundry’ in public. This knowledge may help you in formulating your questions to elicit a proper response. POP-CULTURE: Refrain from using popular culture analogies. For instance, do not use football game or fields to assist in determining distances; instead use soccer references or city blocks. Do not ask them if they have seen a trial on TV, as there are very few TV shows or movies showing courtroom procedures in Spanish. Some may confuse seconds for minutes, so count out the seconds, if you know for a fact that it was a matter of seconds and not minutes. Of course, this depends on whether you are talking to your client or if you are taking a deposition. YOUR BEST FRIEND: Finally, remember that the interpreter is there to facilitate communication. He or she is your nexus. Try requesting the same interpreter for continuity; your client will appreciate seeing the same familiar face over and over again. If you feel that I have missed or overlooked something here, please let me know and I’ll be happy to add it. Carlos, M. and Lois Sellers. 1972. “Family, Kinship Structure, and Modernization in Latin America.” Latin American Research Review 7(2): 95-124. JCNSW. 2015. Equality before the Law Bench Book. Judicial Commission of New South Wales. Sydney NSW. http://tinyurl.com/p8lezc7. Accessed May 2017. Lambertini Andreotti, Julia. 2016.Comprehension of Legal Discourse in Interpreter-Mediated Judicial Proceedings. Unpublished Doctoral Dissertation. Tannen, Deborah. 1984. “The Pragmatics of Cross-Cultural Communication.” Applied Linguistics 5(3): 189-95.